There I was at my local Health Hut, all set to check out when the fatal checkout display caught me. Was it the fact that I was fresh out of healthy snack bars for work and these were attractively placed and imminently available? Or was it the limpid-eyed bebeh cheetah? 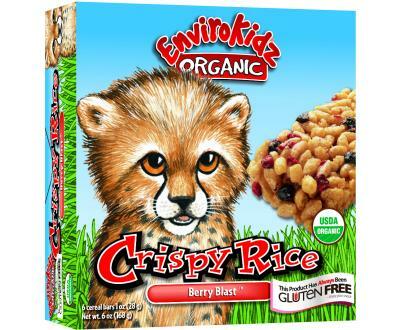 The culprit: Nature’s Path Envirokidz Organic Crispy Rice bars. Yes, “Envirokidz.” We’re all kids at heart, aren’t we? Even with the “z”? I figured anything with this much attention to packaging was worth a shot—okay, I went shopping when I was hungry and the cheetah filled half the box—but of course I checked out the ingredients first. “Studded with freeze-dried blueberries and intense red raspberries,” these gluten free bars had a lot of the sweet stuff, but I decided the full list passed my discerning eye. Did I mention I was hungry? Ingredients: Organic brown rice flour, organic brown rice syrup, organic honey, organic soy oil, organic invert cane syrup, organic evaporated cane juice, organic corn starch, organic acacia gum, organic freeze-dried raspberries, organic freeze-dried blueberries, natural marshmallow flavor (gelatin-free), sea salt, organic molasses, natural blueberry flavor. Now for the important part: The taste! I have a bar a day and I’m enjoying them very much. Small bursts of crispy, fruity, slightly tangy flavor just right for that second breakfast. The bar is soft and comes apart in your mouth, not your hand, and doesn’t leave you with Sticky McStickerson fingers. And it fills me up, which is not that easy to do. 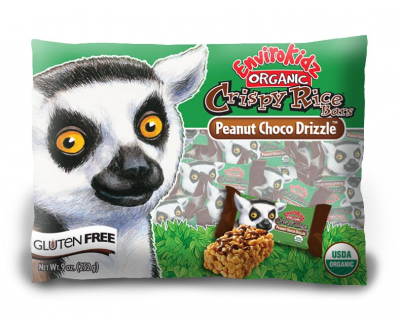 There are other cute animals—er, flavors in the same line that I haven’t yet tried, but Lisa the Health Nut has reviewed the Peanut Choco Drizzle!